On Thursday, January 19 at The Grove in Anaheim, CA, guitar icon Zakk Wylde, surrounded by Roastmaster Sharon Osborne and a slew of metal luminaries, will hold the distinctive honor of being the inaugural honoree of Guitar World’s first ever Rock ‘n’ Roll Roast to benefit MusiCares, which provides a safety net of critical assistance for music people in times of need.A “Wylde” roast…not a bad way to launch a new creative alliance between photographer Mark Weiss and artist David Banegas. Two months ago when they shared an idea to collaborate their passion for music, art and “giving back,” neither dreamed it would come together at such a high profile stage so quickly. 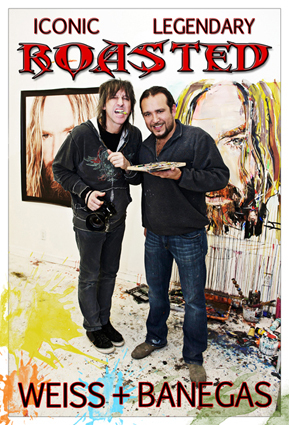 As the guests arrive via the red carpet to the sold out event, attendees will pass by a portrait of Zakk Wylde by photographer Mark Weiss and the mirror image created by artist David Banegas. David will also be painting “live,” a Zakk’s Epiphone Signature Les Paul guitar on canvas to be auctioned off for MusiCares. To Photographer Mark Weiss, there is a special connection with Zakk. In 1987, Weiss, who has been Ozzy Osbourne’s photographer since 1981, was helping Ozzy in his search to find a new guitarist. Mark, Sharon and Ozzy had just returned “empty handed” from checking out a guitar player in Long Island. 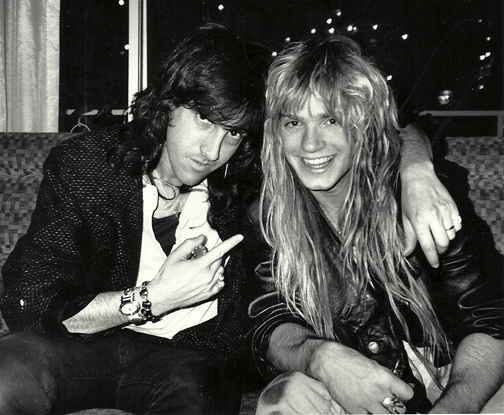 Mark’s last words to Ozzy and Sharon were, “I’ll keep my eyes open.” The next day, Weiss’ friend Dave Feld told Mark to give this kid he saw at a local club a listen. It was Zakk, a NJ teenager, still living at home with his parents. Mark sent the photo and cassette for Ozzy to check out. Sharon called Mark and told him to bring Zakk to LA to audition. And here we are, 25 years later, celebrating the incredible guitar work of the Black Label Society front man. Mark Weiss has been auctioning his iconic photographs to benefit Lunch Break, the soup kitchen in Red Bank, NJ. At a Lunch Break fundraiser, David painted live from a photo of Elvis. David’s unique execution of the image caught Mark’s eye. whois discovery The two had an idea to have David paint Mark’s most iconic rock ‘n’ roll images. Both men, as artists who create visuals live, and in the moment, want their work to help bring focus and funds to charitable causes.